In 2012, the folks at Good Karma Ranch were ready to make an investment in reducing their future energy costs. 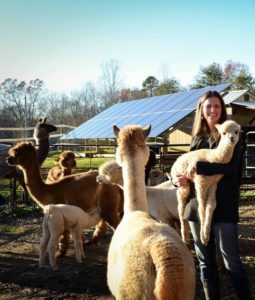 At the same time, because of their dedication to raising alpaca and operating a farm, they recognized the importance of protecting the environment. They had previously been subscribing to a renewable energy program through their electric company, but wanted to make a more direct impact by building and owning clean energy on their property. In consultation with their solar installer, Renu Energy Solutions, the farm’s owners the Walshes decided that a solar energy system should be mounted on the ground in order to best meet their needs. The 5-kiloWatt solar system would still be located close to the large barn which would use the power produced to offset its energy, over time letting the solar pay for itself as electricity rates fluctuate and rise. 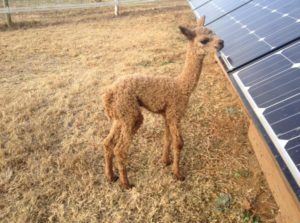 With ample space and alpaca willing to “mow” the grass around the panels, a ground-mount system would have the benefit of never having to be removed from a building for roof repair or other reason. The farm uses power from the solar system and at times can send surplus solar energy to the grid via its solar energy meter, receiving utility credit for it. Prior to the installation, advanced solar energy software was used to estimate the value the solar system would provide over time, which was projected to be nearly $1,000 in energy cost savings in the first year alone. Beyond saving on energy costs, Good Karma Ranch frequently finds that visitors, community members, and business contacts support their solar choice and appreciate the farm’s strides in sustainability. Some farms can even apply for and obtain federal government grants as an added incentive for going solar. 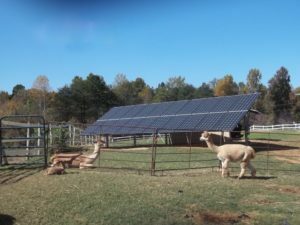 At the farm’s fall alpaca festivals, during open houses and events, and year-round, the solar proves a significant improvement and a green focal point to the farm’s pay-it-forward outlook on preserving the air, water and land.